This year i requested two books from my parents, and pretty much everything else was a surprise. I usually give them a list of a few books i might want to push them in the right direction for present giving. Luckily the two i received i’m very excited about. Me and Sophie also have a tradition (if you can call it that, it’s a relativity new thing) of giving books with a theme. We’ll pick a random theme, this year was ‘prize winners’ and gift each other books from that theme. 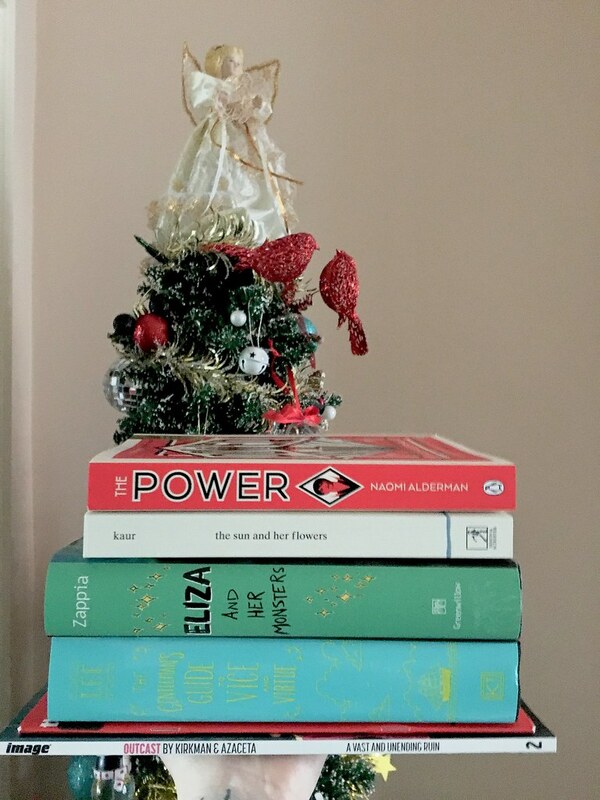 We almost ended with a disaster (or funny story) this year when it turns out we very nearly purchased the same book, and ended up with books that won the Women’s Fiction Prize anyway. I want to say a massive thank you to my friends and family which gifted me these books. I’ve been given the opportunity to read some books i’ve wanted to for a long time, try something new and continue with the Outcast series (something i’ve wanted to do for a very very long time). I’ll make sure to let you know how these books are! Leave in the comments some of the books that you got for the holidays this year! The only one of these I’ve read so far, is The Gentleman’s Guide. I liked it, but really started hating the MC, haha. Still looking forward to the sequel enormously since one of my favorite characters will be the MC in that one! The Power is on my TBR and I got The Sun and Her Flowers from my boyfriend. Definitely going to read that one next year. Eliza and Her Monsters is still on my wishlist, unfortunately. I don’t know how many hints I gave but apparently nobody noticed me really wanting that book. One day!